dock. Box understructure bumpers fit around the car latches to protect door latch. design is finalized by using information provided on the railboard worksheet below. This form must be submitted complete with all orders for rail dockboards. 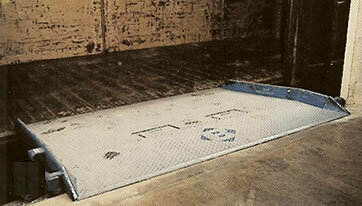 Railboards are site specific products and should only be used at site for which they are designed. X dimension at 20' increments along the dock as well as at 20' beyond the end of the dock (40' beyond if "hy-cube"
cars are used). For Car to Car application provide the Z dimensions in above blanks. level and string, for each dockboard location. 4._____________ Identify the narrowest car door to be encountered at this site (range from 6'-20'). 8.____________ Identify any dock projections within 10" of the top of the dock surface. 9.____________ Provide width of the narrowest opening that the dockboard must pass through. 10.___________ Identify the types of equipment / attachments used to travel across the railboard. 11.___________ Identify the load capacity of the equipment used for this application. car door width encountered at this site. than the carside lip. X dimensions less than 48" can prevent flare. application. Measurements taken on-site are crucial for proper application. 1. 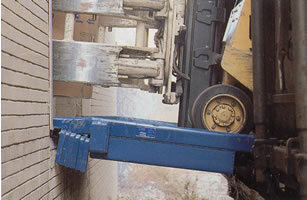 Board can service car to dock gap range of 38" to 48"
range from 41" to 46") AVAILABLE UPON REQUEST. 3. Board can service car heights of 39.5" to 46.5"
Steel Dockboards, and Steel Loading Ramps from your complete source for material handling equipment.